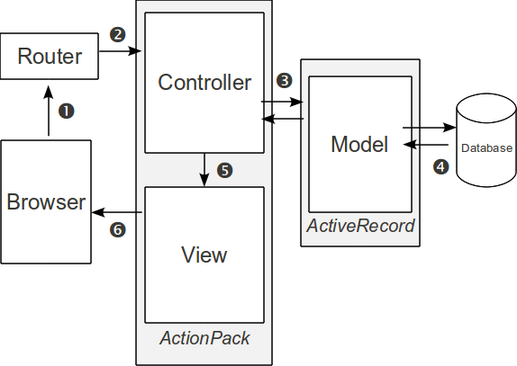 This architecture (which is not unique to Rails), divides the application into three main components, the Model, View and Controller. The purpose of this architecture is to separate the primary functionalities of the web application into three major players: The Controller is responsible for the logic and processing, the Model takes care of querying/storing data and the View detemines how the final result is presented to the user. A typical interaction in the context of a Rails web application is outlined below and illustrated in the figure on the right. An HTTP request from a user's browser is taken by the router which processes the request. The router determines which Controller to activate based upon the request (the URL often determines which controller is used). The Controller performs the actions necessary to satisfy the user's request. (The controllers are represented by different classes; their methods correspond to different actions.) During the course of processing the request, the Controller may query the Model. The model communicates with the database to retrieve and/or store data, as requested by the Controller. After the Controller action has completed an appropriate View template is selected. While these View templates may contain programming logic, it is usually kept at a minimum. Most of the logic should be performed in the Controller when possible. This view template is sent back to the user's web browser for display. Ruby on Rails makes a number of assumptions about the location and names of various files, classes and methods. These assumptions mitigate the need for numerous configuration files related to your web application. Once you are familiar with these conventions, development, deployment and maintenance of your web application can become easier. The Model implemented by ActiveRecord provides support for object-relational mapping (ORM). This enables you to treat items in the database as if they were objects. Informally, database tables are represented by classes, database rows are represented by objects and database columns are represented by object attributes. In other framesworks, a number of XML files are necessary to do this mapping. Rails uses convention over configuration and dynamic code generation to make ORM more automatic. Associations between database tables are also handled in the context of the ORM. Rails can generate a lot of the foundation code upon which your application is based. These code generators follow the conventions mentioned above and make it easy to build simple applications with rails quickly. Unfortunately, the code generated can be difficult to understand for novices (at least, initially). For this introduction, we'll generate a very, very simple Electronic Medical Record (EMR) application. We can use the new subcommand of the rails command to generate the foundation for the application. The README file contains many helpful details regarding the files and subdirectories generated as well as some hints on what to do next and how to debug your application. The most important subdirectories we'll be dealing with is the app subdirectory which contains subsubdirectories that contain the files for the models, views and controllers and the db subdirectory which contains the database as well as files related to the creation and modification of the database schema. Many log messages will be displayed in this window as you access your application from a web browser. Viewing these log messages can be helpful when diagnosing problems with the web application. If you get a message about the port already in use, a server is already running on that machine using that port (probably a server you started earlier). Either kill that server or use a different port, for example: rails server -p 3001. When you are finished, remember to kill the server by pressing Ctrl-C in this terminal window. Or you can find the process ID using the ps and kill it off manually. When the server has been started we can access it through our web browser by visiting the URL: http://localhost:3000. We'll open a new command line window (leaving the window that we used to start the server) and set up our path using the . /users/cs/grad/donald/pub/rails/setpath command again. Many of the controllers methods (called actions in the context of rails) have corresponding views in the form of .html.erb view template files. The Patient class used in many actions in the controller contains several class methods that allow us to implicitly query the database my calling these methods instead of having to write cumbersome SQL commands. This is part of the ORM aspect of Rails. The member variables set in the controller actions are available inside the corresponding views. For example, in the index action of the controller, the @patients array contains a list of all the patients in the database. In the index.html.erb file, we iterate over this array to display the details associated with each patient in an HTML table. # Update an existing patient in the database. # Remove a patient from the database. Much of the functionality for this class is either inherited or created dynamically during runtime as the database is queried by the controller. We'll be adding validation and associations to this model shortly. Another file generated is a database migration file. A migration file is simply a ruby program that describes how the database schema (or the data itself) is to be modified as the database evolves over time. The migration generated for us below creates a table named patients with the specified columns in the database. To actually create the schema in the database, we need to apply the migration by running a task to migrate the database to its new state. In rails tasks are run using a utility program called rake, with the name of the task provided as a command line argument. (A list of all tasks can be generated with $ rake --tasks.) To migrate a database, we specify the task named the db:migrate. By default, the sqlite3 database is used, however other databases are supported as well including MySQL, DB2 and Oracle, to name a few. When you click on the New Patient link, the new action of the PatientsController is called. This creates a empty patient object which is stored in the @patient member variable (no database access is done). The new.html.erb form is then generated. Because this form uses the _form.html.erb partial, this partial will also be rendered. After the form has been completed and the Create Patient button has been pressed validation occurs (see below) and the create action of the PatientsController is called. This creates a new patient object (@patient) initialized with the data supplied by the physician in the form. This form data is available in the params hash. This patient object is then saved to the database and we are redirected back to the show patient view to show the newly created patient. A similar sequence of events happens when you modify a patient, except that the edit/update actions are called instead of the new/create actions. Also, during the call to edit the model is consulted (@patient = Patient.find(params[:id])) to find the patient in the database whose id matches that selected by the physician in the list. The _form.html.erb partial employed by the edit.html.erb view uses this object to pre-populates form with the patient's details. Unfortunately, our application has problems. For example, we can create patients without actually filling in any of the fields. We can create invalid/duplicate MCP numbers. Fortunately, models provides an easy way to validate data before actually storing it in the database. To make the application feel a little more "real-world", we can populate it with some random data. This is known as seeding the database and can be done by modifying the db/seeds.rb file. For example, the script below will add 100 random patients to the database with address, birth dates and MCP numbers. STDOUT.sync = true	# Prevent output from being buffered. Each patient has a collection of progress notes associated with it. The views for these progress notes will be handled by the patient views, so we'll just generate a model and a controller for the progress notes. First we create the model. Observe that each note references a patient (in SQL context, this is the foreign key) and as content field that contains text. We re-migrate to introduce the progress note table into the database. The ProgressNote model generated above is as follows. The belongs_to :patient creates the association between the note and the patient to whom it belongs. We must also create an association in the opposition direction, informing the Patient model that it may have zero or more progress notes. Now, if patient is a Patient object we can access its associated progress notes by using the syntax patient.progress_notes. We can create a new progress note for a patient using the syntax patient.progress_notes.create(...). We'll see examples of these later on. The generated class is very simple with no methods. We'll manaully add a create method. This method will be called when the physician clicks on a Create Progress Note button in a view that shows a patient that we'll see later. The create action queries the database for the patient given the patient id, then creates a progress note for that patient initialized with the contents of the progress note's text field. After the note has been created, we redirect to the view that shows the patient and all of his or here progress notes. In order to show the progress notes in the patient view, we modify the app/views/patients/show.html.erb template. If there are no progress notes, we'll display some text indicating this. Otherwise, we'll iterate over all the patients progress notes displaying the date the note was created as well as the contents of the note. The block of code following the conditional display of the progress note is a form that allows the physician to create a new progress note. Because a progress note is a nested resource, the form_for syntax in this case takes a list of objects that illustrate this nesting. When the user clicks the submit button created by the form, the create method of the ProgressNoteController will be invoked. Finally, we can modify the view that shows a listing of all the patients (app/views/patients/index.html.erb). The modification will add an extra column that shows how many progress notes the physician created for each patient. The db/seeds.rb can be modified to create random progress notes for each of the patients. This creates progress notes by grabbing random words from the /usr/share/dict/words file and adding them to the progress note associated with a patient. Note again, the use of the patient.progress_notes.create(...). syntax. # Generate gibberish for the progress notes. Ruby on Rails Demonstration (Part II). This is a more detailed talk I gave on Rails v2.0.2 three years ago. Rails has changed a quite bit since then, but many of the general ideas are similar.